– The exercise afterburn effect, also know as excess post-exercise oxygen consumption (EPOC), is when the body continues to burn calories after the exercise session is over. For example, let’s say you go for early morning jog for 30 minutes. After you have finished the 30 minute jog, your body will continue to burn calories for the next 15 minutes to 48 hours! EPOC represents the amount of oxygen consumption needed to bring the body back to a pre-exercise state. The amount of calories burned from EPOC is directly related to exercise intensity and duration. The harder and longer you exercise, the more you will burn off calories via the excess post-exercise oxygen consumption effect! – Exercise intensity, according to all the studies conducted to date, is the most important determinant of the afterburn effect. The harder and more intense you exercise, the greater the exercise afterburn effect. In another study published in the Journal Of The American College Of Nutrition, the effects of low and high intensity exercise on how 8 women, ages 22 to 31, burn calories during exercise and after exercise were studied. Although both groups burned 500 calories, the effect of epoc was much greater for the high intensity group (45 extra calories) versus the low intensity group (24 extra calories). Effect Of Duration On EPOC! Duration also has been shown to play a big role in the energy afterburn effect. In one study conducted in 1988 published in the Canadian Journal of Sports Science, subjects were divided into 3 groups. Although all three groups exercised at 70% of their VO2 max, the duration was different for each group. One group exercised for 3o minutes, another group for 45 minutes, and the final group exercised for an hour. The results of the exercise afterburn effect values of the studies were 33 calories lasting 128 minutes, 74.5 calories lasting 204 minutes, and 165 calories over 455 minutes for the durations of 30, 45 and 60 minutes, respectively. 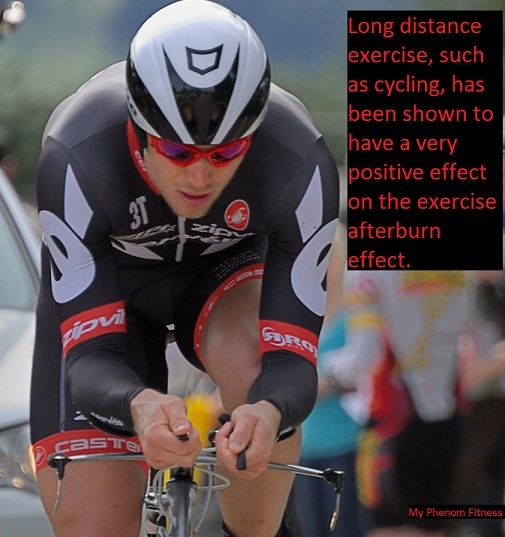 This study showed that increasing exercise duration has a great effect on the exercise afterburn effect. In another similar study (1), 6 healthy male subjects exercises at 70% of their VO2 max for 80 minutes, 40 minutes, and 20 minutes. The results of EPOC were 55.5 calories, 73.5 calories, and 159.5 calories for 20 minutes, 40 minutes, and 80 minutes respectively. There have also been studies that have combined high intensity exercise with longer durations. There are more studies such as these that show similar effects of duration’s effects on excess post-exercise oxygen consumption. In a study published in the European Journal of Applied Physiology and Occupational Physiology, 8 trained males performed 164 minutes of treadmill running at 70% of their VO2 max. The average exercise afterburn effect effect was 162 calories, which is a significant contributor to overall energy expenditure. 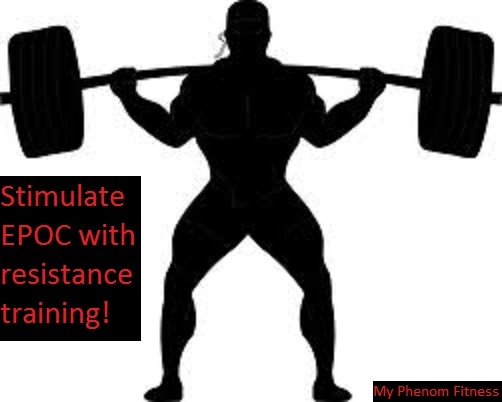 If you really want to shed off calories optimally from epoc, I would highly recommend performing intermittent training, which is a form of interval training. Intermittent training consists of shorts bouts of all out exercise followed by a rest period. You would repeat this over and over throughout the course of the workout. The Fields Sprints workout video is an example of an interval training workout. A study published in the Journal of Applied Psychology consisted of 8 males performing 20 1-minute intervals at 105% VO2 max with corresponding 2 minute rest periods between intervals. The same 8 males also performed 30 minutes of continuous exercise at 70% VO2 max to allow for comparisons. The results showed a significant increase in the afterburn effect for the interval training (75 calories) versus the continuous running (34.5 calories). So we have pretty m uch covered everything about the exercise afterburn effect on cardiovascular exercise, but what about strength training?! Although it is difficult to compare cardio to resistance training because of just the sheer difference of the type of workout and exercise intensity, there have been studies trying to compare them. In a study published in the Journal of Applied Sport Science Research, the subjects were broken down into 3 groups. One group performed 40 minutes of cycling at 80% of their maximal heart rate. Another group performed 40 minutes of circuit training (50 percent of individuals’ maximum lift [1 RM] x 15 repetitions x 4 sets) and the final group performed 40 minutes of heavy resistance lifting (80 to 90 percent of 1 RM x 3-8 repetitions x 3 sets). Heavy resistance training produced the greatest afterburn effect ( 53 calories) compared with circuit training (51 calories) and cycling (33.5 calories). Tempo Training: Continuous aerobic exercise at a high intensity for half an hour to an hour. 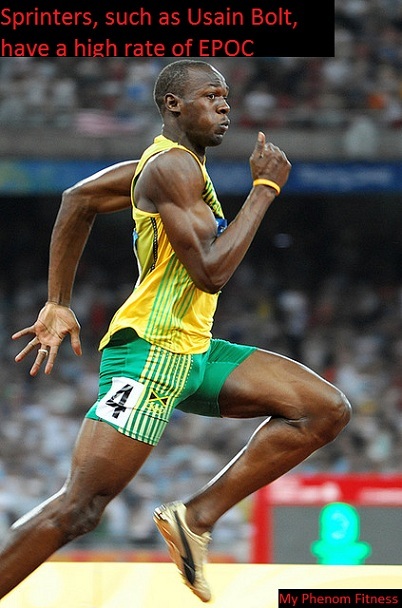 Long, Slow Distance Training: Continuous aerobic exercise at a moderate intensity for an hour. Split Training: 2-4 high-intensity exercise bouts for a period of 15-25 minutes with a 5 minute rest in-between. Continuous Interval Training: Alternating 3-minute bouts of low-intensity and high-intensity exercise for a period of 30-60 minutes. An example of this would be to walk for 3 minutes, then jog for 3 minutes, then walk for 3 minutes, etc. Or if you are in very good shape, you would jog for 3 minutes, sprint for 3 minutes, jog for 3 minutes, etc. Switching up the intensity during your workout will increase the rate you burn calories at and may be a good way to make your cardio a little more exciting. Supramaximal Interval Training: 15-20 bouts of really high intensity exercise (the hardest you can exercise) for a period of 1 minute, with 2- to 5-minute rest periods in-between. This will be the most taxing and most intense form of exercise but it will allow for the most effective way to burn calories. Heavy Resistance Training: 2-4 sets, 8-10 exercises, 3-8 reps of 80%-90% of your 1-rep max with 2- to 3-minute rest periods will allow to burn calories effectively via the exercise afterburn effect. Circuit Resistance Training: 2-3 circuits consisting of 6-10 exercises with 10-12 reps at 50% 1RM with only 30-second rest periods between circuits. This is also a good way to burn calories via the exercise afterburn effect. 1. Bahr, R., et al. 1987. Effect of duration of exercise on excess postexercise oxygen consumption. Journal of Applied Physiology, 62 (2), 485–90.